Need mulching around your home or business? Call for a Free Site visit and Estimate. Did you know that mulching reduces the amount of grassy area in your yard by reducing mowing, pollution and water usage? 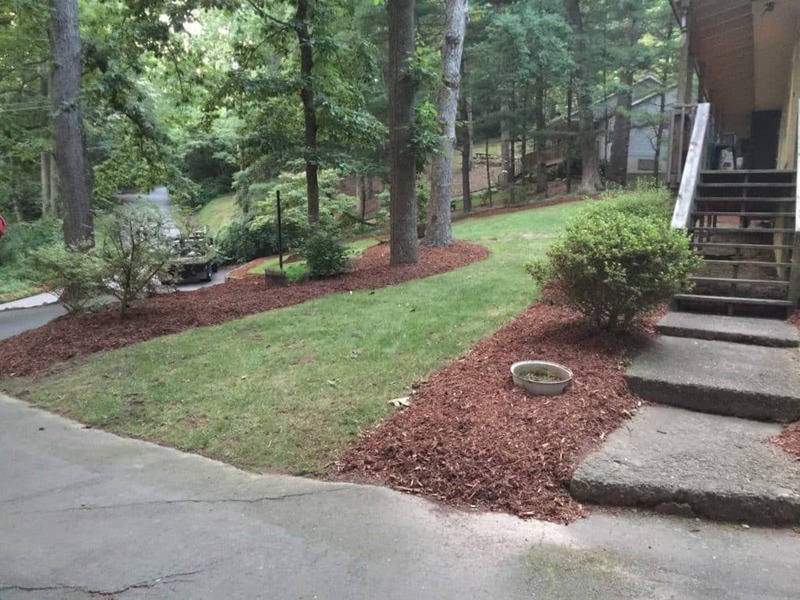 Mulching also provides other important benefits to your lawn and landscaping design by: setting excellent barrier for weeds and other invasive plants, reduces the amount of water normally needed by keeping soil temperatures down, reducing evaporation, reduces the need to use additional soil necessary for plants to grow. Mulching adds valuable nutrients to the soil as well. It decomposes over time and is time-released composting! Types of mulch include Cypress, Cedar, or Pine wood. All are excellent at repellants and controlling a variety of pestilent insects; such as ticks, chiggers, gnats, etc. Most natural wood mulches (non-dyed products) promote an increase in worm activity which is always a good thing in any garden or yard. Worms love to eat the decaying mulch which in turn creates great soil also. We are insured and we offer free estimates.